In my previous post, I shared Dan Meyer’s analysis of what’s wrong with computer-based mathematics assessments. Dan focuses his critique on the Khan Academy’s eighth-grade online mathematics course, identifying 74% of its assessment questions as focusing on numerical answers or multiple-choice items. This is a far cry from the constructing, analyzing, and arguing tasks advocated by the Smarter Balanced Assessment Consortium and the Standards for Mathematical Practice of the Common Core. Why the mismatch? Dan doesn’t have a definitive answer, but he offers a reasonable explanation: Developing innovative assessment items that can be scored by a computer is hard. Hard yes, but impossible no. In my previous post, I offered an example of a Web Sketchpad assessment that I developed in collaboration with Steve Rasmussen, Scott Steketee, and Nick Jackiw. Now I’ll showcase another sample of ours to demonstrate that the introduction of a computer into the assessment process need not mean the death of good, interesting questions. This question is a snap for a computer to grade, but as an example of a problem that requires higher-order thinking, it’s a dud. By contrast, try the interactive Web Sketchpad assessment item below. It deviates from the traditional approach above by providing just one piece of information—the triangle’s hypotenuse—and asks you to make a triangle with that length. When you’re satisfied with your triangle, press Show Your Score to check your answer. You’ll receive 3 points for a correct response and 0 points otherwise. I don’t think I need to convince you that this Web Sketchpad assessment item is a significant step up the cognitive demand ladder from its static counterpart. I especially like the opportunities for discussion it provides for the entire class after students have completed their individual assessment. For example, what values other than √17 can serve as the hypotenuse if the triangle’s two legs have integer values? Will the square root of any integer create a solvable problem? 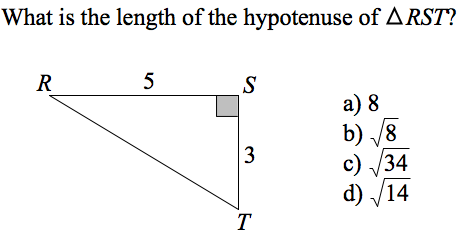 Can students make a list of 20 possible hypotenuse lengths? Stay tuned for two more Web Sketchpad assessment items in my upcoming posts! I commented on the Dec. blog about the technological ability of the problem, but this is a significant uptick in looking at comprehension. I like how the SNAP POINTS feature was used. I like where you’re going with this. I’m glad you liked this assessment question. I’ll have another assessment post to share some time this week.